Despite their repeated stance that their public works of art should be appreciated mainly for the complex process leading to their creation as well as their striking visual effect, Christo and Jeanne-Claude, creators of such works as Wrapped Reichstag (1995) and The Gates (2005), have never shied away from controversial materials or sites. Oil barrels first appeared in their work in 1962, one year after the Berlin Wall was erected to separate East and West Germany. In Wall of Oil Barrels – The Iron Curtain, Christo and Jeanne-Claude closed off the rue Visconti in Paris with a four-meter high wall made of 89 stacked oil barrels. The concept was quickly scaled upwards when, following the Six-Day War in June of 1967, the couple proposed their first large-scale use of barrels. Ten Million Oil Barrels Wall, which would have sealed off the inland waterway of the Suez Canal, was never realized. Smaller-scale oil barrel projects were erected in Cologne and Philadelphia in the late 1960s, but the artists struggled to find the right location and funding to bring their vision to life on a colossal scale. This lithographic poster was one of thirteen prints included in the portfolio that accompanied America: The Third Century, an exhibition commissioned by Mobil Oil to celebrate the United States Bicentennial in 1976. The bicentennial took place just two years after Christo, a refugee from post-war Communist Bulgaria, became a U.S. Citizen. 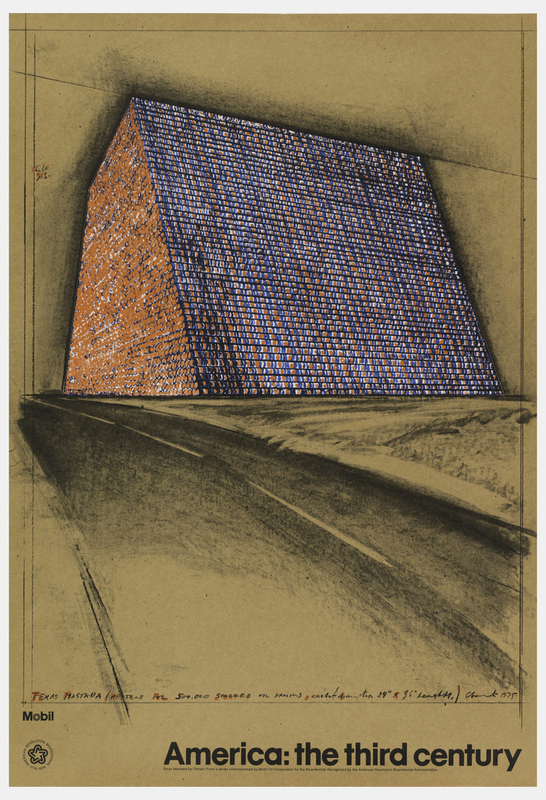 [i] The poster reproduces a sketch for the Houston Mastaba, first conceived in the late 1960s amidst the country’s growing dependence on foreign oil. The massive trapezoidal structure takes both its name and form from that of an ancient Egyptian tomb characterized by a wide base, sloping walls and a flat roof. Monumental in scale, the Houston Mastaba, composed of 500,000 stacked oil barrels (though a 1970 collage titled One Million Stacked Oil Drums reveals that artists had originally proposed an even larger work), was intended for a site on the side of a highway between Houston and Galveston, Texas. Inclusion in the portfolio was likely seen by the artists as an opportunity to drum up support for the project, which, like the 1967 wall across the Suez Canal, was ultimately scrapped. Today, a towering Mastaba, measuring almost 500 feet in height and comprising over 410,000 barrels, is currently under construction in the desert 100 miles south of Abu Dhabi. [ii] Conceived by Christo and Jeanne-Claude for the oil-rich United Arab Emirates in 1977, this Mastaba is one of three projects that the couple was actively producing when Jeanne-Claude passed away in 2009. Upon completion, it will become the largest sculpture in the world – and the only permanent, large-scale work by the couple. [i] Randy Kennedy, “Christo, Trump and the Art World’s Biggest Protest Yet,” The New York Times (New York, NY), January 25, 2017. [ii] “The Mastaba: Project for the United Arab Emirates,” Christo and Jeanne-Claude, February 11, 2017. Ria Murray is a graduate student in the History of Design and Curatorial Studies program offered jointly by the Parsons School of Design and the Cooper Hewitt, Smithsonian Design Museum. She is a Fellow in the museum’s Drawings, Prints & Graphic Design Department.